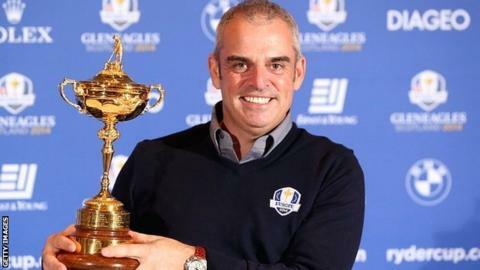 Irishman Paul McGinley has been named as Europe's captain for the 2014 Ryder Cup at Gleneagles. The 46-year-old played in three Ryder Cups, was vice-captain in 2010 and 2012 and holed the winning putt in 2002. McGinley was preferred to Ryder Cup legend Colin Montgomerie, who captained a victorious European team in 2010 and wanted to fulfil the role again. "This is a position I'm really thrilled to be in," said the Dubliner, Ireland's first captain. "It's also a very humbling experience and I can't wait to get into the role of captain and to working with the players." World number one Rory McIlroy and Ryder Cup stalwarts Luke Donald and Justin Rose all publicly backed McGinley for the captaincy of the biennial event against the United States. And McIlroy welcomed the appointment, writing on Twitter: "Common sense prevailed in the end.... Couldn't be happier for him... Roll on Gleneagles." Northern Ireland's Darren Clarke, the 2011 Open champion, was originally the favourite but formally requested not be considered. Scotland's Paul Lawrie, Open champion in 1999, and Spain's Miguel Angel Jimenez were also considered. The decision was made by the European Tour's tournament committee, led by chairman Thomas Bjorn, after a meeting in Abu Dhabi. Scotsman Montgomerie, who played in eight Ryder Cups, was seen by some as better able to oppose American choice, eight-time major champion Tom Watson. But in recent times Europe have taken the view that the Ryder Cup captain should serve for one match only, with Bernard Gallacher ('91, '93 and '95) the last man to lead the side more than once. A winner of four European Tour titles, McGinley's best campaign was in 2005 when he finished runner-up three times before lifting the season-ending Volvo Masters crown. It will be his acumen as a leader that will help decide whether Europe record their sixth victory in the last seven matches. And while the Dubliner may not have had as much individual success as eight-time European number one Montgomerie, many felt he did enough as a vice-captain (in 2010 and 2012) and as Britain and Ireland's two-time winning Seve Trophy captain to suggest he has the ability to lead Europe. "It's amazing how much you can learn when you listen and don't talk," said McGinley, referring to the media scrutiny surrounding the decision. "I knew I had the support of players and felt the more I said the more my chances would lessen." In 2009 McGinley cajoled a supposedly weaker GB and Ireland team to a 16½-11½ victory over a continental Europe side led by Bjorn. Opposite number Watson tweeted: "Congrats to Paul McGinley on your R/C Captaincy. Looking forward to our future competition. You're a class act." And McGinley said he was relishing taking on "one of my great heroes". "Tom Watson is not only a wonderful person abut a great ambassador for the game of golf," added McGinley. "I've never had an opportunity to go up against him in a playing sense. To go up against him in a captaincy sense will be a real thrill for me." Will Monty edge out McGinley for 2014?